Enterprise Resource Planning: ERP systems provide day-to-day means to manage operations and related administrative functions: sales-to-cash, accounting, reporting, compliance, HR, supply chain, customers, procurement, sales orders, invoicing, distribution, logistics, and wrapping around Manufacturing with Information Technology (IT) and Operation Technology (OT). Product Lifecycle Management: enterprise PLM manages the product data creation process, up to handshake with Manufacturing and ERP. Application Lifecycle Management: ALM integrates with PLM, leading into Manufacturing and ERP for consolidation and continuous alignment. Asset Performance Management: APM as is about connecting the industrial assets, such as machines and control systems, but also products in operations in the field, with the information systems and the people who are running, maintaining or using it. Most of the product information is gathered, created and matured within the product innovation chain. The associated BoMs are not only owned by engineering, but rather represent multiple sets of information which support the product development lifecycle. During that stage, there are commonly 4 principal BoMs that most manufacturers refer to, plus 1 reference BoM (hence referred here as the “0.5 BoM”) which is relevant to the supplier chain (customer data provided to both design-to-print and build-to-print suppliers). Various checks and balances are required to ensure BoM consistency and alignment throughout the product development lifecycle and change management process, especially as product requirements evolve and mature. Comparing “as-designed” (EBoM) and “as-manufactured” BoMs allows to ensure that what was designed can be built. Running automated BoM simulations to verify the above is an important step of the product configuration change management. Product orders are translated into another type of BoM which contains all customer specifications. Another BoM includes what is actually built based on the customer order. Continuously comparing “as-ordered” and “as-built” (MBoM) allows to ensure that what was ordered can be built to specification, accounting for ongoing engineering and manufacturing changes to be accounted for. Once delivered to customers, products and other enterprise assets must be maintained for operational purposes. Operational data is subject to service and maintenance changes. Based on the industry and type of product, data is modelled with one or more BoMs, which can for instance include specific MRO data as required in the aerospace industry. Comparing “as-built” (MBoM) and “as-maintained” (SBoM) allows to perform ongoing support. Enterprise assets will be continuously maintained; this might also be included into an “as-operated” BoM based on industrial operational requirements. Logistics requirements might also be captured in “as-delivered” BoM for further traceability, etc. There are opportunities to link “as-maintained” BoMs with in-flight or in-field data, captured for instance from machine sensors or vehicle telematics and other Internet of Things (IoT) devices. 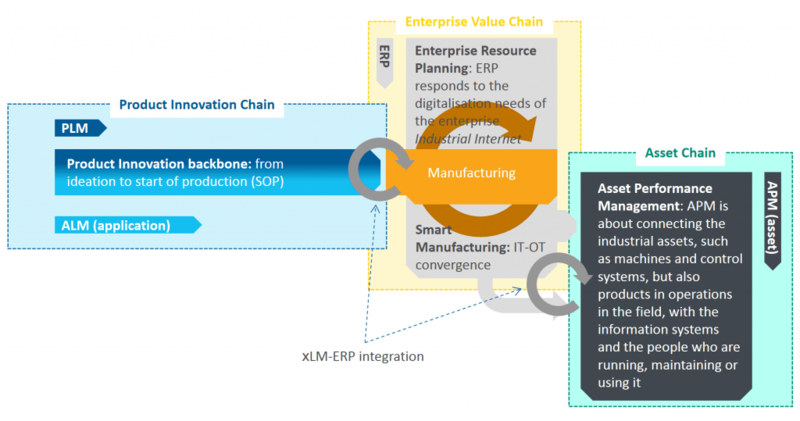 This will contribute to closed loop data alignment bridges which will continue to challenge how xPLM (PLM and ALM) and ERP systems are integrated. The “8.5 BoMs” described above typically mature alongside each-other, in a complementary manner, at different speed and stages of the enterprise product lifecycle, while feeding each other with multiple input / output data elements across a range of functional and technical requirements (ref. the “Periodic Table of PLM“). They are aligned or synchronised so that data flows from one function to another, and from one system to another. Each BoM is ideally mastered in one system. Typically, multiple processes contribute to creating and maintaining each BoMs, whose source data is stored and managed across multiple enterprise systems. The denomination of these BoMs might differ from one industry to another, or one business to another, based on product complexity and other business parameters such as: engineering vs manufacturing driven, design-to-spec vs build-to-print, engineering-to-order vs manufacturing-to-order, expected production volumes, level of product personalisation, type of maintenance and operations, asset type and respective lifecycle. This post was originally published on LinkedIn on 18 May 2018.